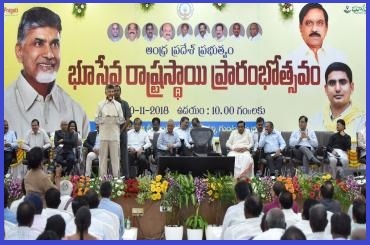 Andhra Pradesh Government has unveiled Bhuseva and Bhudaar web portal through which people can view land records online. People can get land record records online through these portals using Aadhaar card. On the occasion, Bhudaar security policy was also launched to provide security to the land records of farmers. Bhudaar is an 11 digit unique identification code to be assigned to each agriculture land holding and rural and urban property. It will allow people to get land details on their mobile phones. It will help to bring transparency in land records. It will also provide information related to all transactions of particular land or property in a single source. Bhudaar will also provide a history of transactions initially for the past 12 years. Revenue, Panchayat Raj, Municipal Administration, registration, survey & settlement, forest, endowments, and waqf departments are engaged in making this service available to the people. Unique ID for permanent Bhudaar will start with 28 and if it is government land, 28 is followed by 00. Bhudaar card can be generated by the land-owners or property owner from Bhuseva web portal. Two types of Bhudaar cards are available including e-Bhudaar and M-Bhudaar. Under Mobile Bhudaar, one has to download the application on mobile. One can also get the Bhudaar card from Mee Seva centres.